Who doesn’t like listening to music? Personally I cannot even work without listening to music. Music just enhances your mood and makes you more productive, if you ask me. Music is something very personal to us. These melodic stories we listen to can simply do magic! Each one of us has a different taste when it comes to music and if you ask me, the feeling of the music a person has said a lot about their personality. But let us not get into the spiritual stuff. You are here for the Wondershare TunesGo Review, and that is what you are going to get in this post. I will be focusing on the features, and we will see how well this tool performs when it comes to syncing music on different platforms. iTunes is a pain to use, and I personally consider it as a system resource hogging software that just does more than it needs to. I have been looking for an iTunes alternative for a long time, and I came across Wondershare TunesGo. This tool allows me to sync music between my PC or Mac to my iOS device. Not only that but unlike iTunes, this software also supports Android devices. Wondershare TunesGo is available for both Mac as well as Windows, so it is a multi platform solution, which is great! Syncing is a primary feature of the tool, but you can do a lot of stuff including organizing your music library, recording new stuff and downloading music from YouTube as well. Let us take a look at the features one by one. 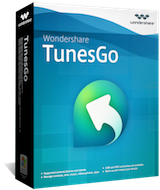 Visit Wondershare TunesGo to download the respective setup as per your system – Windows or Mac. After downloading, just run the downloaded setup and follow the instructions. The software will be installed in no time. 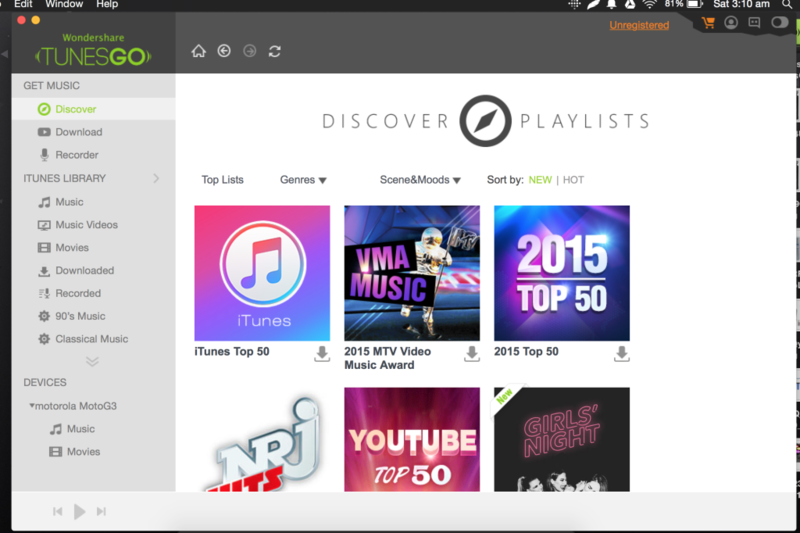 As a stand alone music and video syncing program, Wondershare TunesGo allows you to discover music that is trending in different categories as well as genres. You can listen to these tracks, and you can download and sync to your device as well. You may download a whole playlist quickly, and sync after that will also be easy. You can download songs that you like from various different sources. 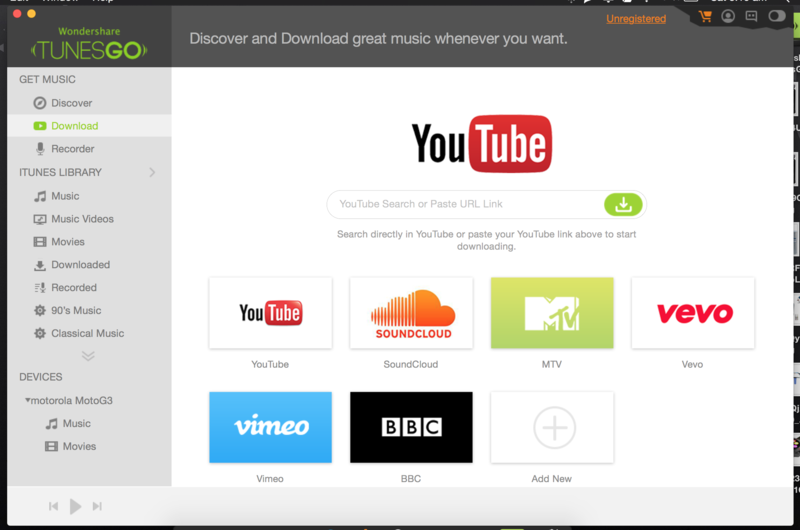 Sources that work with Wondershare TunesGo are YouTube, SoundCloud, Vevo, Vimeo, BBC, and MTV. You also have the functionality of adding a new source from you can download songs and sync to your device. The recorder functionality in this program lets you record any song that you might want to record. It a nice feature if you, as a musician, want to record a track. In case you already have a library set up with iTunes, Wondershare TunesGo will import all the data along with the tracks and it will make sure that none of the files is left. 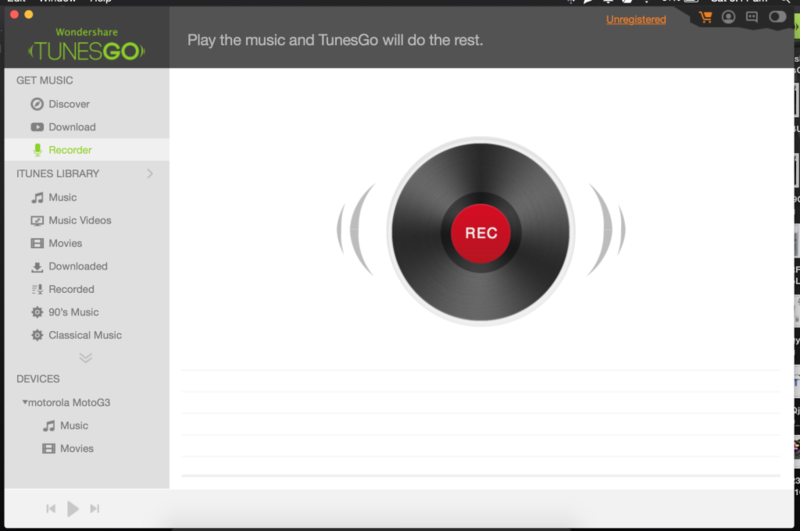 It assures a seamless migration from iTunes to Wondershare TunesGo. I have an iOS device as well as an Android device. This program works well on both the platforms. It functions on the similar lines as iTunes and can sync music as well as videos from your system to your device easily. With Android, it uses the Android debugging bridge to do the tasks, and it still works great. How to setup a device with Wondershare TunesGo? Now that we know what the features of this software are, we can go ahead and start setting up a device. I tried setting up an Android device, and all you needed to do was connect the device via USB and follow the onscreen instructions. The setup was done in no time! While iTunes is a system resources hogger, Wondershare TunesGo has a full potential to replace iTunes for the needs of syncing your music as well as video files. 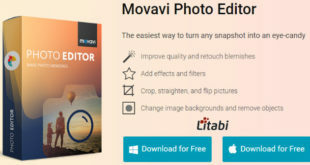 The features like Discover and Download make it a fantastic software for adding new contents to your library. Let is not forget about the Recorder that comes with this software. It works great in terms of real life performance as well. What do you think about this versatile software to sync music? Share your views in the comment section.